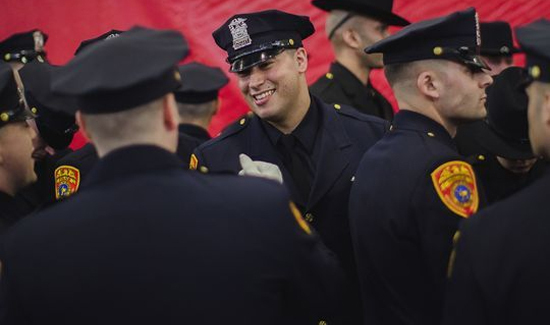 A U.S. Marine veteran who lost his legs during a tour of duty in Afghanistan is believed to be the first-ever double amputee to become a full active duty police officer in the U.S.
Matias Ferreira (above, center) was sworn in Friday as an officer with the Suffolk County Police Department in New York, six years after he stepped on an improvised explosive device in Afghanistan. The agency, in a Facebook post, said the injury didn’t deter him from achieving his life-long dream of becoming a police officer. Ferreira was sworn in with a group of 58 other officers, 43 of whom also had prior military experience. The class elected Ferreira its president and underwent 29 weeks of training. They’ll start work in the coming week. The 28-year-old uses titanium prosthetics, Fox News reported. He was born in Uruguay and came to the U.S. when he was 6, the network said. He dreamed of being a cop as a kid.